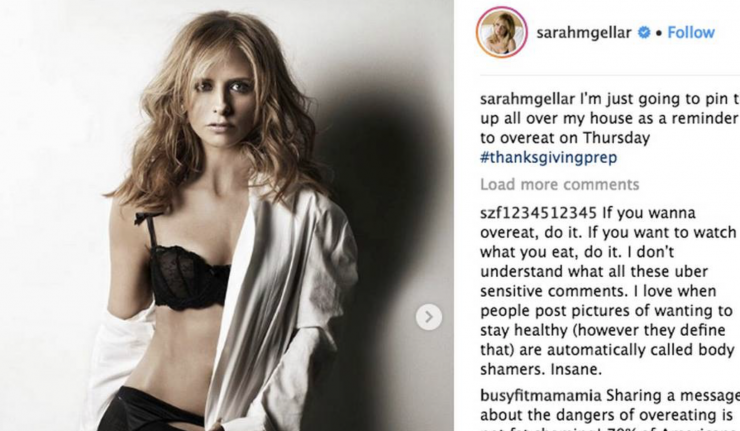 November 23rd, 2018 – Sarah Michelle Gellar upset a lot of fans earlier this week when she posted old photos of herself in lingerie as a reminder to not overeat when Thanksgiving day arrived. While the Buffy the Vampire Slayer star is no stranger to fighting back, she instead chose to apologize to those offended by her playful Instagram post. On Sunday, Gellar shared four photos from a photoshoot she did with Maxim in 2007. While her over 2.2 million followers didn’t seem to mind the poses, many did have a problem with the caption – placing an intention of perpetuating harmful standards onto the 41-year-old actor. “I’m just going to pin these up all over my house as a reminder not to overeat on Thursday #thanksgivingprep,” the caption reads. Instagram users flooded the comments with messages of disapproval and pleads to Gellar to think about the ages of those following her account. “How empowering for women! Disappointing to use your platform to promote thinspiration on a once a year holiday that should be about togetherness and gratitude,” another user added. Gellar, who co-founded a food crafting brand and e-commerce startup and wrote a cookbook just a few years ago, reminded people that she was only speaking to herself in that caption and did so in a lighthearted manner. Gellar chose to keep the Instagram post and continued to share her Thanksgiving thoughts once the big day arrived. In posts and stories, she showed off her dishes and didn’t seem too worried about overeating once the turkey came out of the oven. Oops caught by @realfreddieprinze Happy Thanksgiving!! As Black Friday rolled around, Gellar continued to post about the holidays and plenty of fans came to her defense.